Organic facial cleansers are great additions to any skin care routine. The skin is the largest organ in the body and it absorbs a large amount of the chemicals that we apply to it on a daily basis. Therefore, it’s generally not a good idea to put anything on your that you wouldn’t put in your mouth. Organic cleansers leverage the power of nature’s most potent fruits, vegetables, herbs, and clays in order to dramatically cleanse, repair, and nourish the skin—without using gnarly chemicals. Additionally, natural cleansers can be just as effective as their traditional counterparts (some even do an amazing job at removing super heavy makeup), so you don’t have to trade your health for effectiveness. Whether you have dry, sensitive, acne-prone, aging, oily, or normal skin, there is an organic face wash out there that’s sure to work wonders for your skin. There are many kinds of face washes and cleansers on the market—each crafted for a different skin type. Most organic cleansers can generally be bucketed into two categories: foaming vs non-foaming cleansers. Foaming cleansers contain surfactants and natural foaming agents that work themselves into a lather to break apart dirt, oil, and impurities. Non-foaming cleansers do not create a soapy-lather and come in a variety of forms including oils, creams, and micellar water. Conventional wisdom claims that foaming face cleansers are bad for dry skin types because the suds strip away your skin’s natural oils; however, many modern organic cleansers use soaps made from vegetable oils (like coconut, jojoba, and sunflower) which can actually add moisture to the skin. With all this jargon, choosing the right cleanser for your skin type can be tricky. Check out our short guide on Choosing the Best Organic Face Wash for Your Skin Type at the end of this page for some tips. Still need help choosing the best organic skin care products for your skin? Then, check out The Ox Box! Each quarter, we’ll put together a box filled with premium organic skin care products hand-selected for your specific skin type and skin conditions. 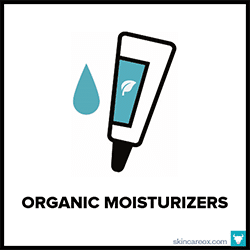 While organic face washes may be better for your skin’s overall health, organic products are not created equal. Many cleansers sold today are filled with cheap preservatives, potentially toxic chemicals, and harsh soaps that can actually irritate your skin and exacerbate existing issues. 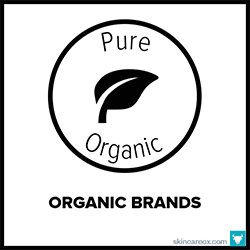 Some cleansers that are branded as “organic” may actually contain cheap fillers and very little organic material. Others make wild claims about their results—all while overcharging for common and inexpensive organic ingredients. We tirelessly researched hundreds of organic brands, their claims, ingredients and their products to create this list of over 40 (actually) organic face washes. At the very minimum, the organic cleaners on this list will not include any toxic chemicals from the “dirty dozen” like Sulfates, Parabens, Phthalates, Petrochemicals + Mineral Oils, Synthetic Fragrances + Dyes, PEG compounds, and Ethoxylated Ingredients. Additionally, all organic cleansers on this list are made with high-quality organic + natural ingredients, contain no harsh soaps, and have a track record of satisfied customer reviews from across the web. These are truly some of the best of the best organic face washes we could find—Enjoy! With hundreds of five star reviews online, this may be one of the most beloved organic cleansers on the market. This organic face wash from Christina Moss Naturals is completely clean and ideal for the most sensitive skin types. It features holistic organic ingredients like saponified coconut, olive, and sunflower oil, as well as aloe, shea butter, and rosemary. A concentrated formula for all skin types. A solid and affordable USDA certified organic face wash made from completely clean and unscented ingredients that won't irritate sensitive skin. While this is a lightly foaming face wash, it uses organic oils (like coconut and sunflower oil) as the basis for the soap so it won't dry out your skin. It's also packed with acne-fighting ingredients such as aloe vera, sesame oil, and neem oil. Packed with antioxidants and moisturizing ingredients, this yummy cleanser from True Botanicals is perfect for mature skin types or those looking to fight the signs of aging. Treat your skin to a dose of green tea, white tea, jasmine flower, lavender oil, grapefruit oil, and vetiver root oil. This formula gently washes away impurities while simultaneously adding moisture into the skin. A must try! Cystic acne sufferers rejoice! This USDA certified organic cleanser gets in deep to clear pores, kill bacteria, and soothe inflamed skin. Even though it contains a powerful dose of anti-bacterial tea tree oil, this cleanser is non-drying and won't strip your skin's natural oils. Other potent acne-fighting ingredients include neem oil, rosemary, lemon, and turmeric. Best for all skin-types with acne. Featuring organic Moroccan argan oil, acai berries, mint, and calendula, this creamy organic cleanser is a fantastic all-around face wash. As a non-foaming cleanser, it won't dry out your skin; however, it's not the best at heavy makeup removal so there is a tradeoff. This is a great organic cleanser for normal/dry skin types during dry climates and cold winter months because it helps to replenish lost moisture. A light and gentle cleanser packed with organic and 100% natural ingredients designed to hydrate, soothe, and balance oil production. This formula is ideal for those with sensitive skin as it is crafted from gentle ingredients like aloe, calendula, neem, and vegetable glycerin. Although it doesn't have a heavy foam, it is actually quite effective at removing makeup and leaving your skin feeling clean. Luxurious and effective! This non-drying lightly foaming organic cleanser from Dr. Alkaitis features 100% certified organic and natural ingredients. It's non-comedogenic (won't clog your pores), incredibly gentle, and contains no fillers (not even water). Fans of this product love that it is powerful enough to deeply cleanse stubborn clogged pores while still leaving their skin hydrated and soft. A mildly foaming USDA certified organic cleanser based on Alteya Organic's signature Bulgarian rose oil. Rose oil has potent antioxidant and anti-aging powers capable of stimulating collagen production, toning the skin, and fighting free radicals. This gentle cleanser is also effective at removing makeup, dirt, oil, and other impurities. Other key ingredients include coconut oil, olive oil, and almond oil. This organic face wash from Eminence is specifically formulated for those with very dry, irritated, and sensitive skin. Ultra-soothing ingredients like organic coconut milk, calendula oil, and coconut oil work together to calm irritated skin while also providing moisture and protection. This cleanser is non-foaming, has a lovely (natural) fragrance, and even does a good job at removing makeup. Although this organic cleanser has no added fragrances, the smell is completely intoxicating. This luxurious face wash combines exotic ingredients like Moroccan red rose, guava, Indian sandalwood, ginseng, and honeysuckle root to gently exfoliate, tone, and balance the skin. It's made with 100% natural and 85% organic ingredients. The vitamins and rose oil in this cleanser make it ideal for mature skin. The ultimate moisturizing organic cleanser! If your skin loves coconut oil, then this is the face wash for you. The product is USDA certified organic and made with yummy ingredients like coconut milk, coconut oil, Japanese honeysuckle, and vanilla extract. This is a gentle and creamy formula that is a joy to use each day. Skin is left soft, supple, and noticeably more hydrated. This soap-free organic face wash is great for those with dry and/or mature skin types who also have sensitive skin. For dry skin and wrinkles, ingredients like rosehip seed oil, aloe, and hyaluronic acid will work to plump, hydrate, and retain moisture all day long. For anti-aging, CoQ10 gives your skin the energy that it needs to rebuild. This non-foaming cleanser is gentle and great for the winter months. A fantastic anti-aging organic cleanser from luxury skin care brand Eminence Organics. This advanced formulation gently exfoliates the skin with finely ground organic olive seeds and a yummy natural AHA cocktail made from lemon, passion fruit, grape, and pineapple extracts. Then, compounds like Tahitian Monoi oil, CoQ10, and plant stem cells go to work to tighten skin and reduce the visible signs of aging. An ultra-gentle chamomile organic face wash made with 100% natural and 86.8% certified organic ingredients. Key ingredients include chamomile (anti-inflammatory), rose water (toning), and aloe (hydrating): perfect for healing dry, irritated, red, and problematic skin. This cleanser is very hydrating (you almost don't need to apply moisturizer afterwards) and leaves your skin feeling clean + soft. This is a solid daily organic face wash that is packed with vitamin C and antioxidants to fight the early signs of aging. Vitamin C plays a major role in helping to protect our skin from environmental pollutants and free radicals that can damage our skin cells--hence the product's name: Intense Defense. With daily use, this organic cleanser can help to mitigate the early signs of aging caused by sun damage. This USDA Certified Organic cleanser is non-foaming, fragrance-free, and gentle enough for sensitive skin. It's made from the purest ingredients like aloe, olive oil, jojoba oil, geranium oil, lavender, and sweet orange oil. The non-foaming formula isn't the best at removing heavy makeup, but it does a great job at removing light makeup and refreshing the skin. Great for all skin types. Simply one of the most popular organic face washes on the market--and for good reason! This organic cleanser from popular organic brand, Beauty by Earth, is an affordable, clean, and all-around effective product for all skin types. It's really got something for everyone: a gentle foam removes makeup/dirt/oil, fruit extracts help to tame oil and control breakouts, and yummy oils help to replenish lost moisture. Crafted from super gentle and soothing ingredients like chamomile tea, calendula oil, sunflower oil, and rosemary extract, this organic face wash from Eminence is ideal for those with rosacea or highly sensitive skin. It's non-foaming, won't dry out the skin, and significantly reduces facial redness --all while providing deep pore cleansing results. A true game changer for sensitive skin types. This organic face wash from Naturopathica delivers a mega-dose of gentle hydration with over 50% aloe vera composition. Organic aloe vera can have an incredibly soothing effect on dry, irritated, and inflamed skin. In this face wash, aloe is combined with organic lavender oil, coconut oil, and rose oil to cleanse the skin while providing hydration. Made with 99.8% natural and 67.5% organic ingredients. A perfect exfoliating cleanser for clogged pores, uneven skin tone, and mature skin types! Made from 100% natural and 82% certified organic ingredients, this organic face wash is a true luxury. Using a combination of clays, enzymes, and essential oils this organic cleanser exfoliates, decongests, and minimizes the size of pores. A fan favorite of Tata Harper's with hundreds of five star reviews. A fantastic organic face wash for those looking to brighten their skin and reduce the appearance of dark spots. This USDA certified organic cleanser uses fermented rice water (i.e. sake) as its key ingredient. Sake is rich in acids, enzymes, and minerals that work to brighten the skin through deep exfoliation. Because sake acts as a mild astringent, this cleanser is also great for oily skin. A creamy (non-foaming) organic face wash that is crafted specifically for dry and sensitive skin types. Although it is a non-foaming cream, this cleanser does a pretty good job of removing makeup and grime. Organic ingredients like aloe vera, blackberries, argan oil, sunflower oil, and chamomile help to replenish any moisture lost from the cleansing process. A nice affordable organic face wash. This totally non-foaming 100% USDA certified organic face wash is made with just three ingredients: organic rose water, organic vegetable glycerin, and organic tea tree oil. Simply soak a cotton pad with this cleanser, apply to the face (gently scrubbing to remove impurities), and then rinse off with water. It takes some getting used to, but it really does leave the skin clean, soft, and hydrated. Don't let the name fool you, this organic cleanser creates a very light lather (from saponified coconut oil). Although this face wash was crafted for sensitive/acne-prone skin types, it also boasts anti-aging benefits. While apple enzymes work to unclog pores and kill bacteria, potent antioxidants and essential fatty acids minimize fine lines and wrinkles. Contains 100% natural + 36% organic material. This is a plant-based anti-aging cleanser that uses alpha + beta hydroxy fruit acids, antioxidants, and aloe vera to both exfoliate and repair mature skin. Organic fruit acids from green apples, grapes, lemons, and oranges resurface the skin to improve tone, brightness, and overall complexion. If you’re looking for an organic face wash that will also improve age spots and discoloration--this is it. This little known, but very effective organic face wash from RoseMira is a game-changer for dry skin. It's made with effective ingredients like Bromelain (an exfoliating pineapple enzyme that gently dissolves dead skin cells) and organic honey powder (powerful anti-bacterial and hydrating properties) which can transform dry skin. This non-foaming wash can be used daily or as a periodic dry skin treatment. If your skin suffers from damage due to environmental irritants (such as pollution and sun damage), then check out this luxury organic face wash from Tata Harper. It's soap-free and features clays, fruit enzymes, and oils that have been clinically proven to purge surface impurities and protect the skin. With daily use, it helps your skin to have a clearer, softer, and more even complexion. This organic cleanser has won multiple awards for its acne-clearing abilities including "Best Acne Cleanser" by the Aesthetician's Choice Awards and "Best Acne Collection" by DaySpa Professionals. It's a non-foaming cleanser that features tea tree oil, cucumber, almond milk, and probiotics/yogurt as its main acne-fighting ingredients. These compounds reduce redness, kill bacteria, and hydrate the skin. Not your grandmother's soap bar! This fan-favorite organic facial cleansing bar from Soapwalla is a real hidden for those with sensitive, oily, acne-prone, or generally problematic skin. It's made with the cleanest food-grade + organic ingredients (like saponified oils, coconut fatty acids, bamboo charcoal, and tea tree oil) that work to kill bacteria, tame oil, and gently remove impurities from the skin. This organic face wash can seriously remove heavy makeup. You can either massage this luxurious cream directly onto your face or apply a small amount to a cotton pad to wipe your makeup away. Ingredients like mango butter, sunflower oil, rose oil, and ylang ylang gently dissolve dirt + oil without irritating the skin. Rinse with warm water and you're done (it's so creamy you may skip your moisturizer). Made with organic saponified oils of coconut, olive, and jojoba, this organic cleanser creates a nice foaming wash that won't strip your skin of natural oils. It's 100% plant-based and packed with hydrating organic ingredients like aloe, rosemary, hemp seed oil, lavender, and palmarosa. As with all products from boutique brand Earth Tu Face, this face was has no added fragrances, preservatives, or fillers. Another great anti-aging organic face wash from luxury spa brand Eminence. This non-foaming formulation is best suited for mature/dry skin types, but will work well for anyone wanting firm, plump, and youthful skin. It contains a ton of skin nourishing ingredients like plant-based hyaluronic acid, CoQ10, sea buckthorn oil, and an antioxidant + vitamin rich berry juice complex. Loved by Eminence fans. A solid all-around organic face wash for all skin types. It's made from 99.5% natural, 51% organic ingredients, and none of the bad stuff. This cleanser exfoliates with natural AHA/BHA fruit acids and then soothes and hydrates with aloe + coconut. One of the great things about this cleanser is that it really does a good job of removing makeup, dirt, and oil while leaving your skin feeling super soft. If you're looking for an organic cleanser that's strong enough to really remove all of your makeup at the end of the day--then this is the cleanser for you. Just a little dab of this gel works itself into a rich foam that removes dirt and oil like no other. It's also packed with nourishing ingredients like aloe vera, rosehip extract, calendula, and chamomile to soothe and prevent dryness. which organic cleanser is best for your skin type? There are many different kind of organic face washes on the market–each crafted for a specific skin condition. There are gel cleansers, cream cleansers, clay cleansers, foaming cleansers, non-foaming cleansers, oil cleansers, micellar cleansers, and bar cleansers (just to name a few!). With so much to choose from, here’s a quick and handy guide to selecting the best organic face wash for your skin type. Generally speaking, the best organic cleansers for dry skin are non-foaming cleansers. Non-foaming cleansers do not contain soaps which may strip your skin of its natural oils. Instead, they are packed with moisturizing ingredients and emollients that leave your skin very hydrated. Look for organic cleansers that contain hydrating oils (like coconut, sunflower, argan), honey, hyaluronic acid, exfoliants (to help clear way flakey/dead skin), and aloe vera. Sensitive skin simply refers to skin that is currently or can be easily irritated. Sensitive skin can include rosacea, eczema, psoriasis, or simply skin that doesn’t react well to most products. The best organic cleansers for sensitive skin are non-foaming and contain gentle ingredients like lavender, aloe vera, chamomile, calendula, jojoba oil, shea butter, borage seed oil, and sunflower oil to name a few. Avoid alcohols, foaming cleansers, and anything with strong chemical exfoliants. Normal and combination skin types can generally find both non-foaming and foaming cleansers to be effective. Great ingredients for normal/combo skin include vitamin C (sun protection), antioxidants (slow down the visible signs of aging), clays (help keep pores clear), and natural oils for moisture. The best organic cleansers for oily skin types are foaming cleansers. These cleansers are much stronger at removing oil, makeup, and dirt than their non-foaming counterparts. Additionally, oily skin types should look for cleansers that contain clay, citrus fruits, oils that balance sebum production like jojoba oil. Both foaming and non-foaming organic cleansers will work for acne-prone skin—depending on whether you suffer from dry skin acne or oily skin acne. Acne-prone skin types should look for organic face washes that contain bacteria fighting ingredients like tea tree oil, honey, willowbark, clays (bentonite and kaolin clays), green tea, probiotics, and rose oil. Mature and aging skin lacks moisture and elasticity, which causes wrinkles, sagging skin, and fine lines. Mature skin types will benefit from highly moisturizing non-foaming cleansers that are packed with antioxidants. Deep cleanses and exfoliators are also great for mature skin as they help to speed up our natural cell turnover rate. 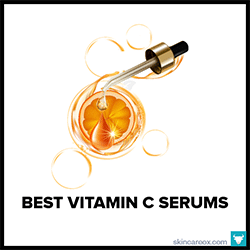 BEST VITAMIN C SERUMS FOR FACEA top list of 13 effective + non-toxic Vitamin C serums by reputable brands. 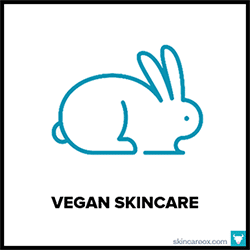 BEST VEGAN ORGANIC SKIN CARE PRODUCTSA list of 42 vegan organic skin care products for flawless skin.